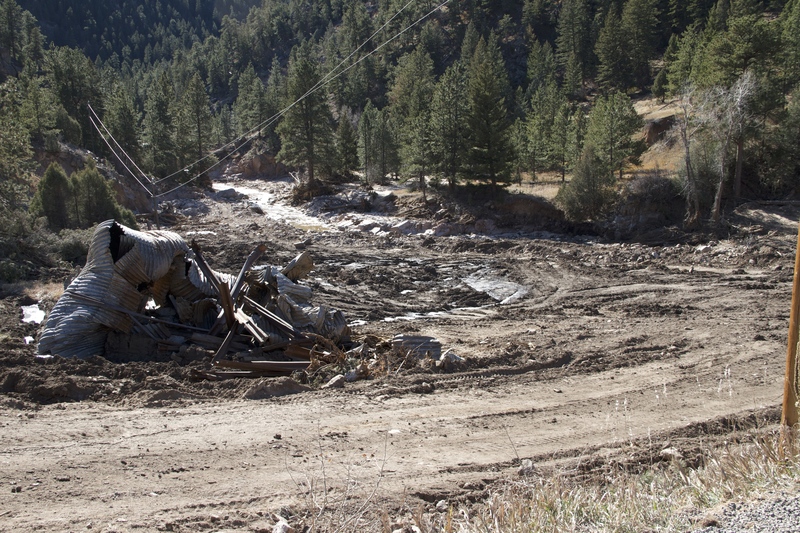 During our road trip to Estes and Lyons, we saw work crews clearing debris. This one was parked in Lyons. I headed up to Estes and Lyons today with Celeste (who did all the driving so that I could take pictures because she’s a great and wonderful friend). Our goal was simple: take a look at the damage now that the road is open, and see how far along the rebuilding, clearing and cleaning has come in the weeks since the flood. 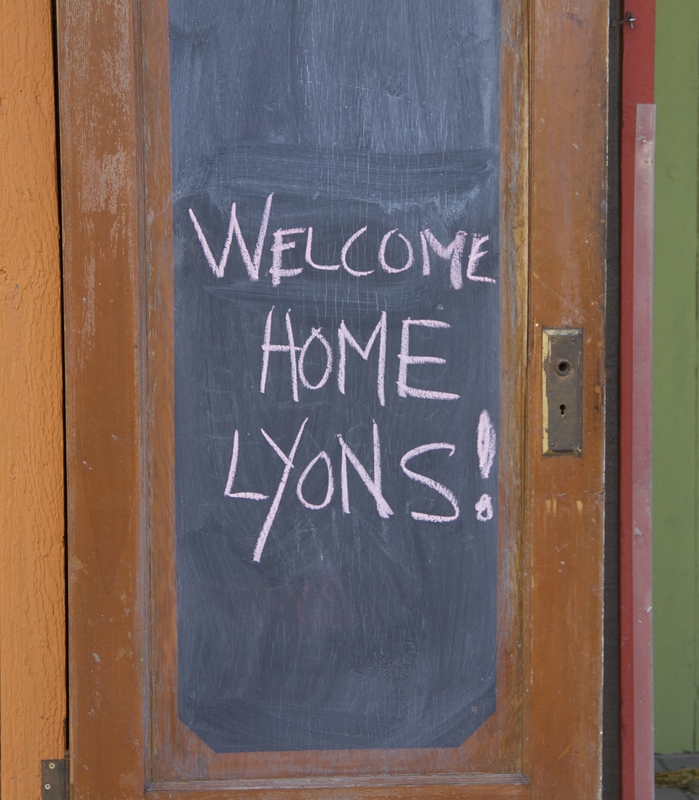 When I first arrived in Colorado, I did not think I would be able to visit Lyons. 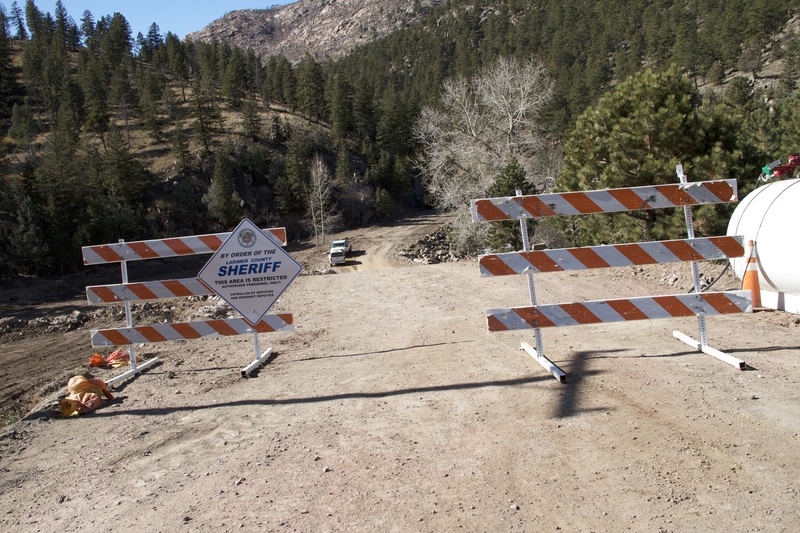 The road closures posted on various state and local government websites suggested that what access existed would be limited to residents. However, yesterday I noticed this was no longer the case and so Celeste and I planned this somewhat impromptu road trip. We saw a lot of construction crews, and could not spend long in any one spot, but we were able to gain a sense of how challenging the work has been. And we both admired greatly the work that’s already been done. Along the way, we stopped where we could so that I could take pictures, or took them from the car window (so, excuse the blurriness in some of them — my camera is good, but this was sometimes pretty tricky!). We started out from Longmont and drove to Estes, then went a little further to the entrance of Roosevelt National Park. The wind was picking up and there was an odd fog in the mountains that suggested snow, so we turned around for the return trip. You can see a map of the area here. This sign was outside the Chamber of Commerce. There was another that read, “Thank You Natl G” in the window. Another sign along the street in Lyons. 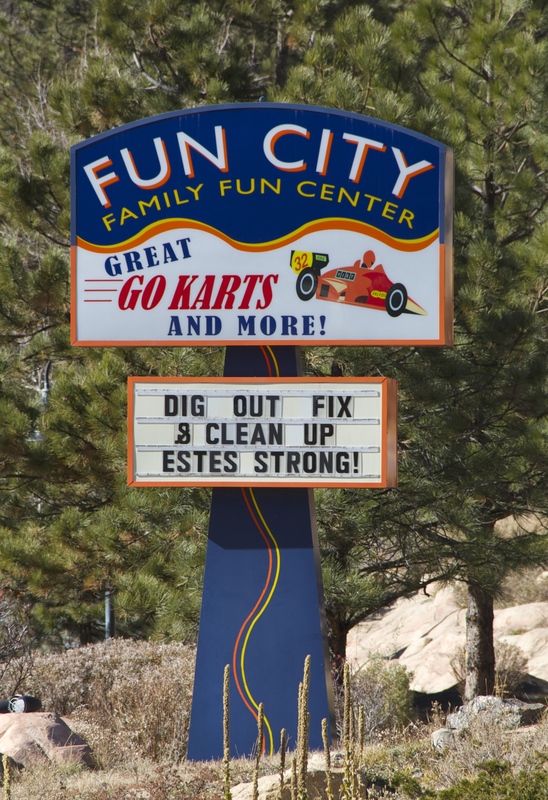 In Estes, this sign seemed to embody the attitude of residents. The North St. Vrain Creek, which is a tributary to the St. Vrain Creek, (mentioned in other posts here and here, and locally referred to as the St. Vrain River), runs along the road as it travels down through the mountains to meet at a confluence with the Middle St. Vrain. Together, they form the St. Vrain. This river, along with the Left Hand Creek, flooded Longmont. The St. Vrain changed course during the floods, and in Longmont it moved away from the floodplains and into neighborhoods and golf courses that were supposed to be safe from flood waters. This story in the Times-Call contains a graphic that shows the change in the course. I’ll be writing another post about it later in the week. 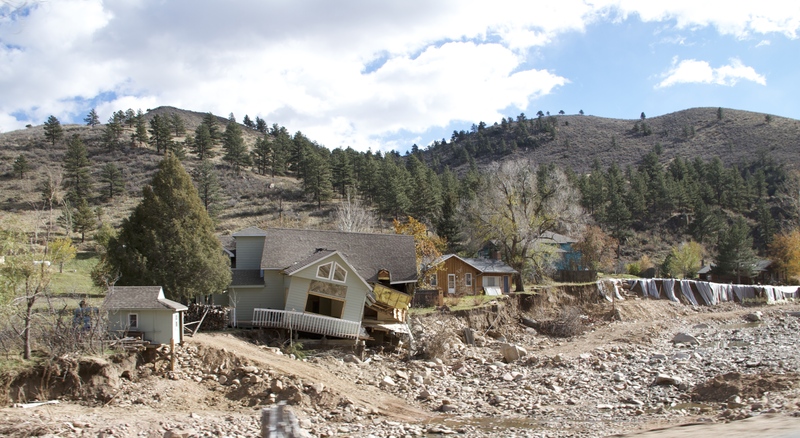 But the St. Vrain had already decided to leave its usual bed long before it reached Longmont, changing course already in Lyons (as covered by the Denver Post) which also posted a video that shows the swollen river inundated the town. While we did see other damaged homes like the ones above and a good deal more debris, we also saw some homes that had been damaged much worse. Yet for most of the damaged homes and other buildings, repairs appear to be well underwear. Many homes appear habitable once again, and some clearly had never sustained this level of damage in the first place. Despite all the damage shown in these photos, the story here is truly one of resilience. We could see the communities coming back together and sense the community-mindedness of the residents. Small businesses along the route that serve visitors were, with some exceptions, open and very welcoming to customers and tourists. While it’s true that in one of the businesses where we stopped employees were still working on getting everything in ship-shape, they were serving food and happy to see customers. 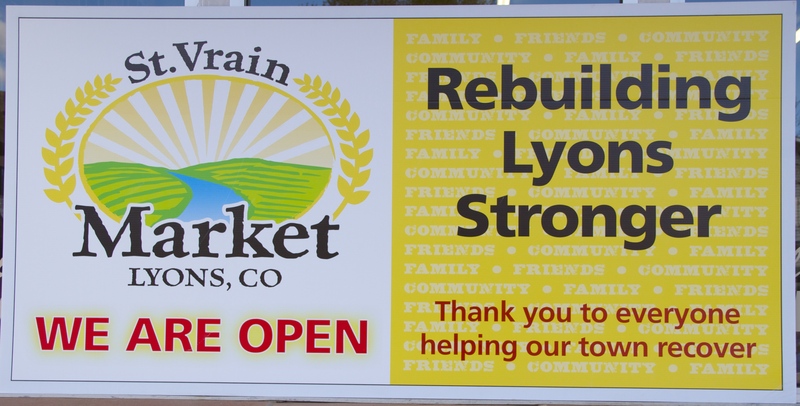 Various shops along the streets in both Estes and Lyons had reopened. Some of the inns and cabins that provide hospitality to tourists remain damaged and are still under repair, but others were clearly back in operation. It was heartening and inspiring to see the mountain communities coming back after so much devastation, and doing so with a sense of community and a deep desire not only to rebuild, but as the signs say, rebuild stronger. Tomorrow I will try to see how the plains communities are doing. The challenge there, however, is that many of their roads are not yet open. With luck, though, perhaps I will be posting those pictures tomorrow evening — and if not, there’s plenty of other things to write about concerning the recovery process going on here!